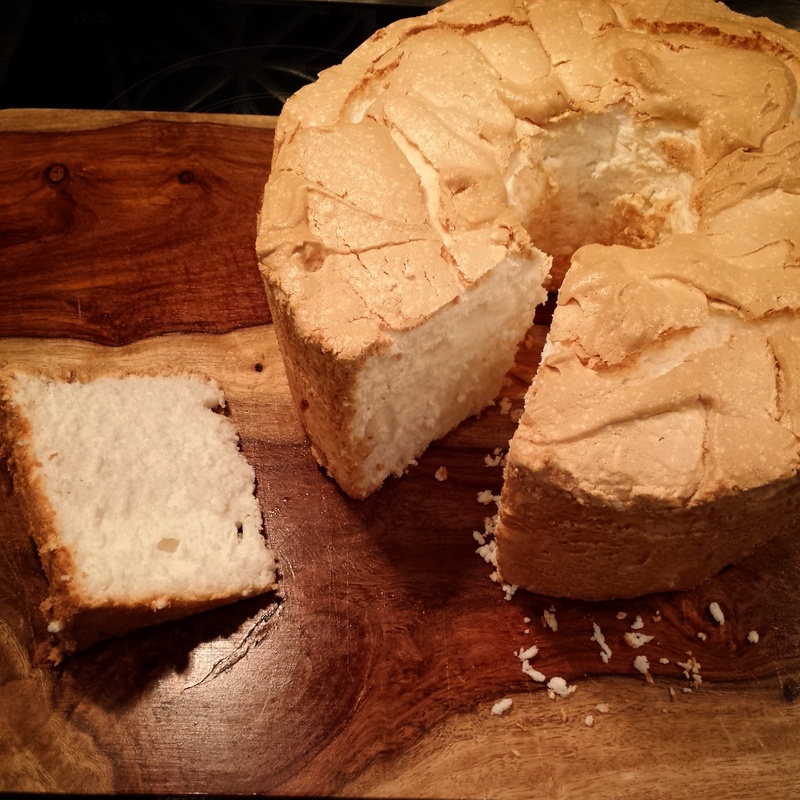 Puffy, Light and Airy Angel Food Cake for Passover and it’s GF too! Fluffy and cloud-like, Angel food cake ranks as one of my all time favorite cakes. Angel food cake is the miracle cake. 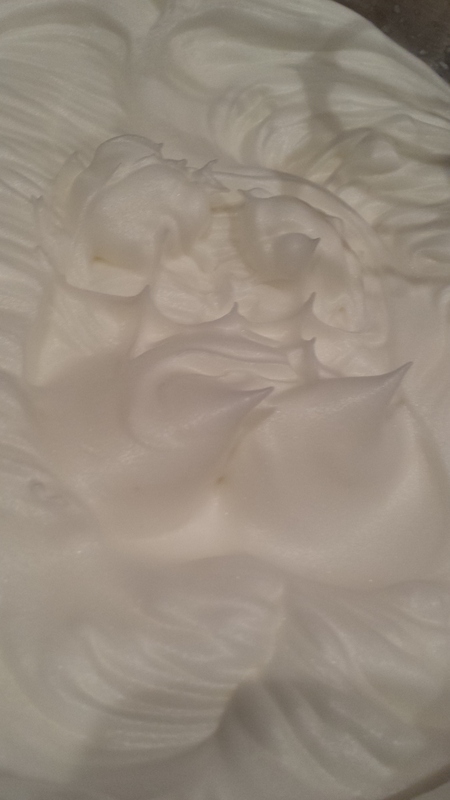 Its simplicity never ceases to amaze me, especially the egg whites that go from gross looking clear stuff into a lovely puffy airy clouds of goodness that stand up forming proud peaks of angelic goodness. This Angel Food Cake, I developed especially for Passover. I was tired of the bland dried out desserts and all the heavy desserts, I wanted something that would be a lovely light finish to the Passover meal. I could not find anything, so I reformulated my favorite angel food cake recipe:) Wala, an Angel is born in the form of a cake! As as bonus, this formula also happens to be Gluten Free and Diary Free. A little note on Angels… they exist… really they do! Oops.. I forgot to mention that you want to make sure that EVERYTHING is grease free. You can wipe down everything with vinegar or lemon juice. Also, make sure that your egg whites are at room temperature- this is why it is good to use organic cage free eggs (I don’t trust the average egg). This recipe makes one Angel Food Cake. 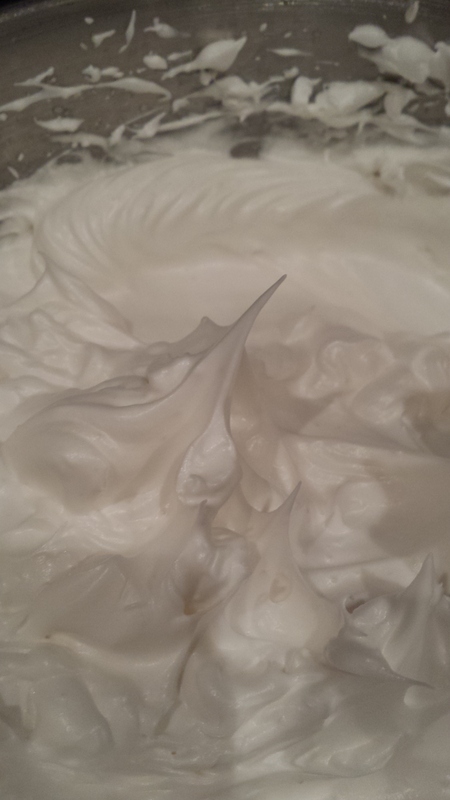 I mentioned before, make sure your egg whites are at room temperature. Usually, I separate my eggs, then place them in a grease free stainless steel bowl in morning while my coffee is brewing, then I cover the bowl tightly with cling film. I put the egg yolks in the refrigerator, then go about my business for the day. In the early evening, I make my angel food cake. One more note about the egg whites, make sure that there is NO yolk in them. When I separate my eggs, I have five grease free bowls. One to crack the eggs into, then another to place the yolk into, another to place the whites into, another to place the eggs that I make a mistake with into and yet another to place the shells into . This is especially good for something that requires so many egg whites. Another reason to do it in separate bowls is that sometime you will get a bad egg. If this happens, no big deal if you are cracking in separate bowls; however, if you are cracking them all into the same bowl, you will have ruined all the egg whites… and it takes a while for egg whites to come to room temperature- to replace the egg whites that you will have to discard. Now that you have 1 1/2 cups of room temperature egg whites, add the cream of tartar and fine pink Himalayan sea salt. 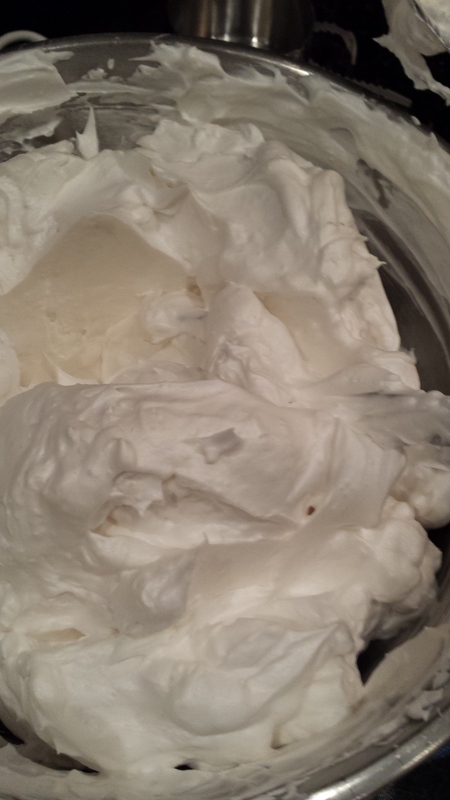 Turn your mixer on low and beat the egg whites with the cream of tartar and sea salt until the mixture is foamy. 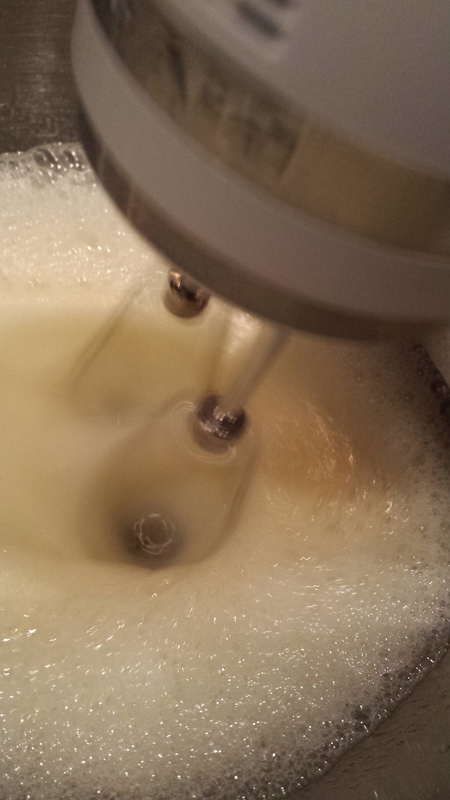 Then turn the mixer up to medium high then high and beat egg whites until they are stiff. 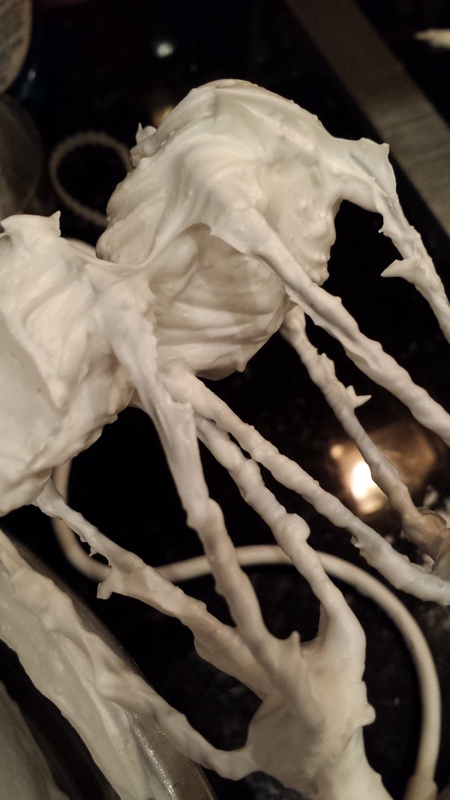 This means the egg white mixture will stand up in stiff peaks once you lift the beaters out. One the egg white mixture is at the stiff peak stage, VERY SLOWLY, one Tablespoon at a time add the one cup of cane sugar to the egg white mixture. Beat the egg white mixture to thoroughly incorporate the sugar after each tablespoon of sugar. There are 16 Tablespoons in one cup so that is going to take a while for you to do… but believe me it is well worth the effort! In a medium bowl, whisk together the potato starch and 1/2 cup cane sugar. 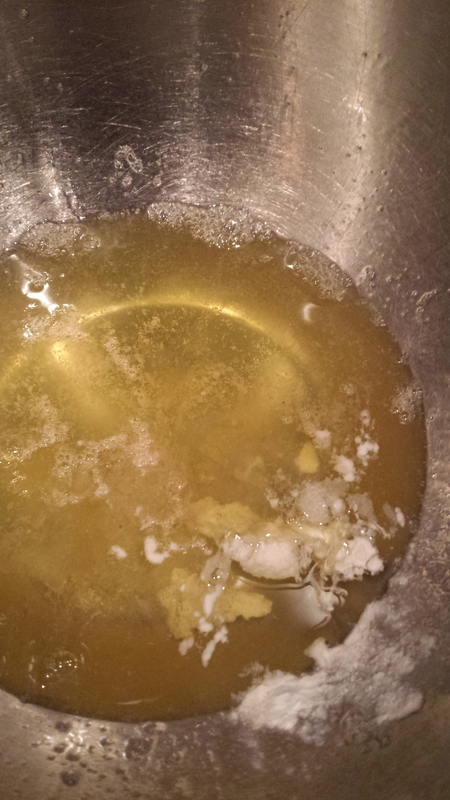 Add this mixture gently and SLOWLY to the egg white sugar mixture until thoroughly incorporated. 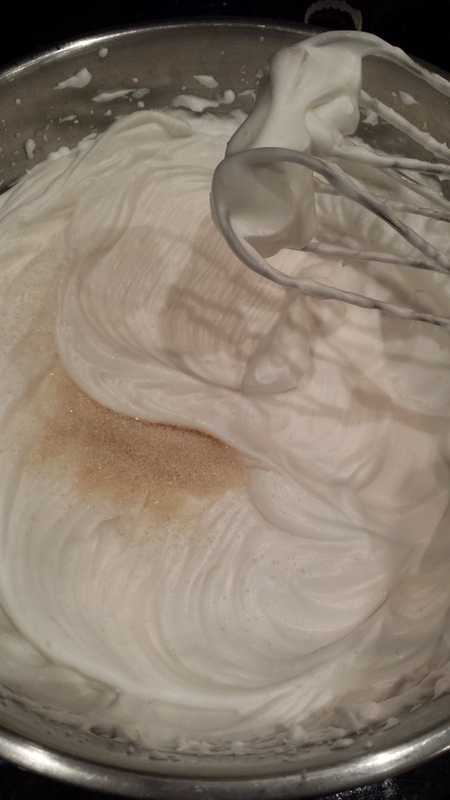 Whipping up Angel Food Cake is quite time consuming.. but well worth it! Then very gently, place mixture into a grease free angel food cake pan. 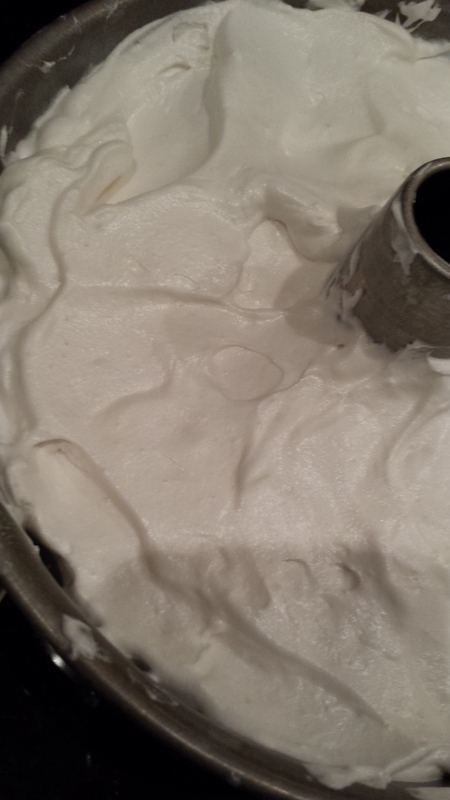 Gingerly, level out the angel food cake batter so that the batter is distributed evenly through out the cake pan. Place on the bottom rack of a 325 F oven. Bake for 60 minutes, do not open the oven until 60 minutes are up. Then very carefully, take the cake out of the oven, immediately, place upside down on a bottle, put the hole of the cake pan over the bottle neck, so that the cake does not fall. If you let it sit right side up, it will cave in. Let cake cool for at least 4 hours. Overnight is perfect! Then once cake has cooled completely, take a sharp knife and run around the cake on inside of the hole in the pan, then run the knife on the inside of the outer edge of the cake. 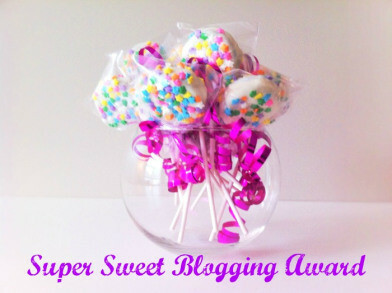 Turn the cake out onto a cake pan or onto a cutting board. If you are not using the cake right away, wrap in cling film until you are ready to use it. It will keep for about 2 to 3 days if wrapped completely in cling film. 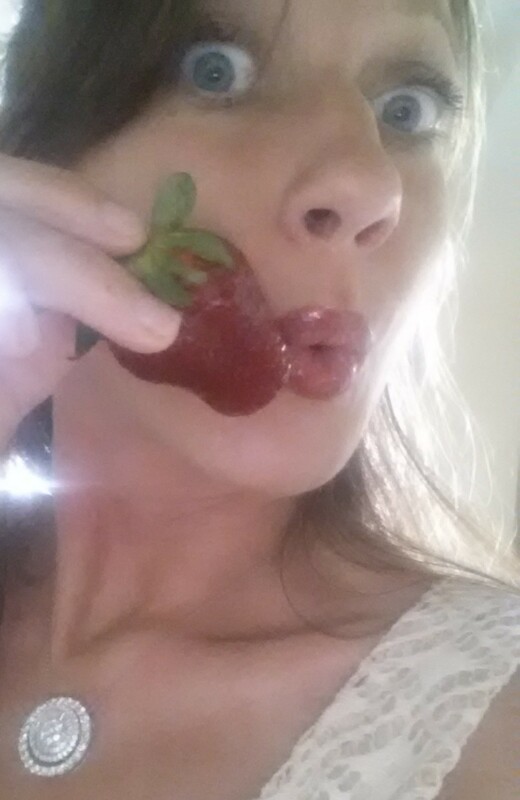 This is really delicious with strawberries!! Tell the world about this! Vanilla Bourbon Cranberry Sauce, You'll never eat cranberry sauce from a can again!